Carlos Ortiz was charged with in Odin Lloyd's murder in 2013. BOSTON — A friend of former New England Patriots star Aaron Hernandez is seeking to dismiss his indictment in the 2013 murder of semiprofessional football player Odin Lloyd. Lawyers for Carlos Ortiz say the grand jury had not been presented with enough evidence to bring the murder charge. The motion was released Monday. Ortiz and Ernest Wallace, both from Hernandez’s hometown of Bristol, Conn., were charged along with Hernandez in Lloyd’s murder. Hernandez was given a life sentence in April. He’s currently appealing the conviction. Wallace’s lawyers have already sought to dismiss the murder charge against their client. 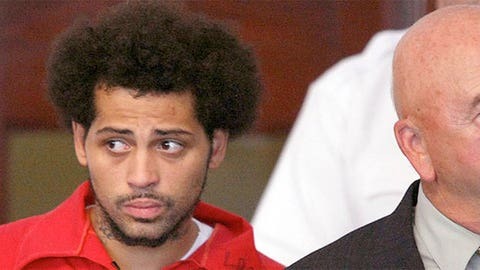 Lloyd’s body was found in an industrial park near Hernandez’s North Attleborough, Massachusetts, home. Hernandez also stands accused of killing two men outside a Boston nightclub in 2012.